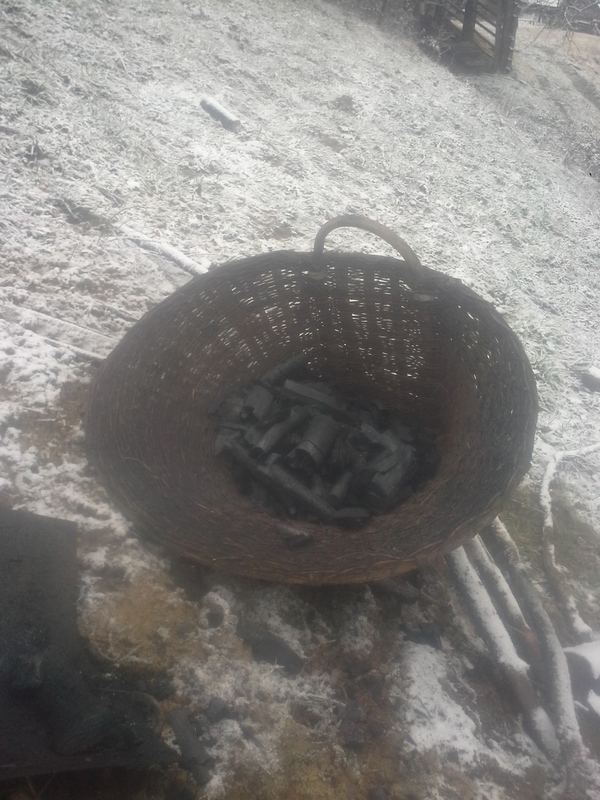 Mercedes is hungry for black gold and my greenhouse stove and the oildrum kiln are unable to feed it so l decided its time to boost charcoal production. Meet my new kiln, named “the Kursk”. Wood is filled at the top, sealed, and fire built underneeth. 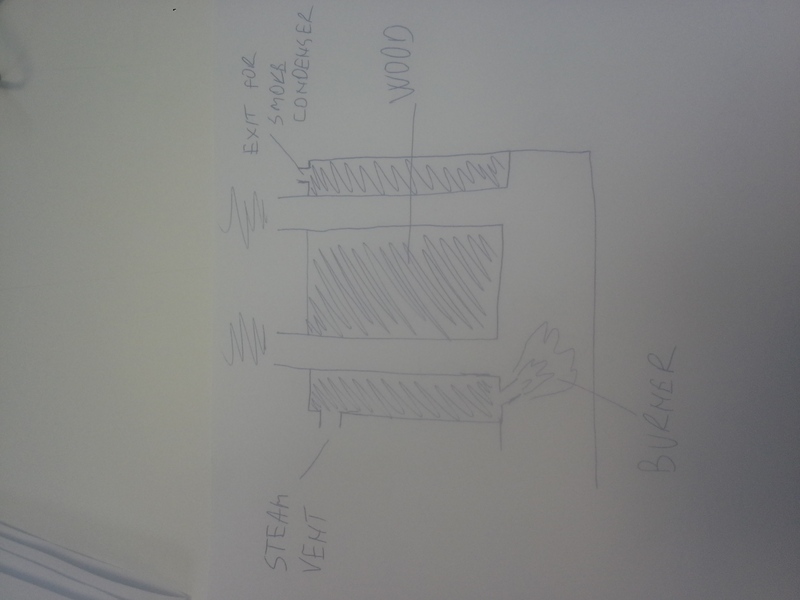 Steam is vented of and when the wood is heated enough to release flamable gas, steam vent is closed and the gas goes in the bottom burning area, ignited and the exhaust vented trugh 4 chimneys runing trugh the wood bed. I first filled some damp wood in and it just steamed and steame for hours and hours so l gave up at 2 in the night and put out the fire. The next day l lit again and the gas was flamable soon. When the Kursk was realy self heating, it started a chain reaction scareing the crap out of me. Allmost half a cord wood was piroliseing in there, no way back now! I am batleing with Youtube to upload a video, see you soon! Wow, that looks great. The Kursk will definitely produce enough charcoal for you. The dirt sure makes a good insulator I like it. When you have time a little drawing of how you built it would be nice. Edit: Does it empty out the bottom, where you build the fire under it? The reason l flared a good portion of gas trugh the steam vent is the bottom/chimneys became dangerously hot . In fact, so hot, just looking at the firepit for more thain a second was impossibly hot, with the clay walls/ground glowing red hot. Anyway, it was all over in about 2 hoors. Now, this morning, the kiln was still hot but l opened it and looked inside. I was sceptical at first, being used to 55gal batches and now makeing a 500gal batch, but upon opening a stone fe in the kiln produceing that butyfull highquality char “cling” sound. Indeed the charcoal is amazeing. 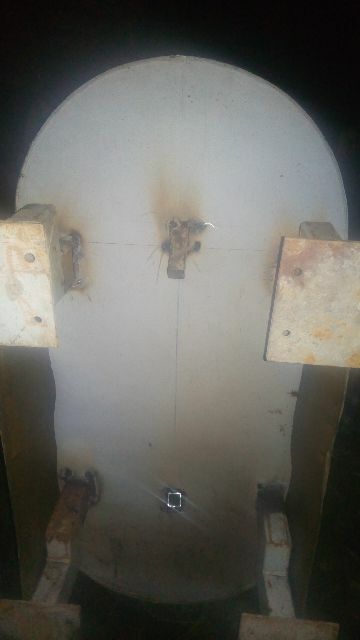 Yes it can be shoveled out from the bottom in a slide l have yet to make, that will lead to the grinder beneeth. Okay that was and BIG hot fire going there. Scary is right! When cooled the char goes In to the grinder. And then a screen below it and into a hopper. Is there a road at the bottom of the bank so you can bring the charcoal up to the car? That would be cool to use the bank of the hill and the slope. Haha, Kristijan you never do anything in a normal way Well, I guess that’s part of why most of us are here - we don’t want to be normal. I know I don’t. I’m amazed how fast this kiln is. I don’t know much about professional charcoal making but I know they were struggeling for a week with that old “kolmila” method. I bet your MB will be thrilled. How far do you think one batch will take you? Yes Bob there is a road right under. I plan to add a sifter to the grinder, do it all in one. And a big silo fot engine grade char, make my own filling station. Well theoreticly the kiln shuld produce about 150kg in a charge. Minus the dust and all, a burn shuld be enough for about 1000km or a month. 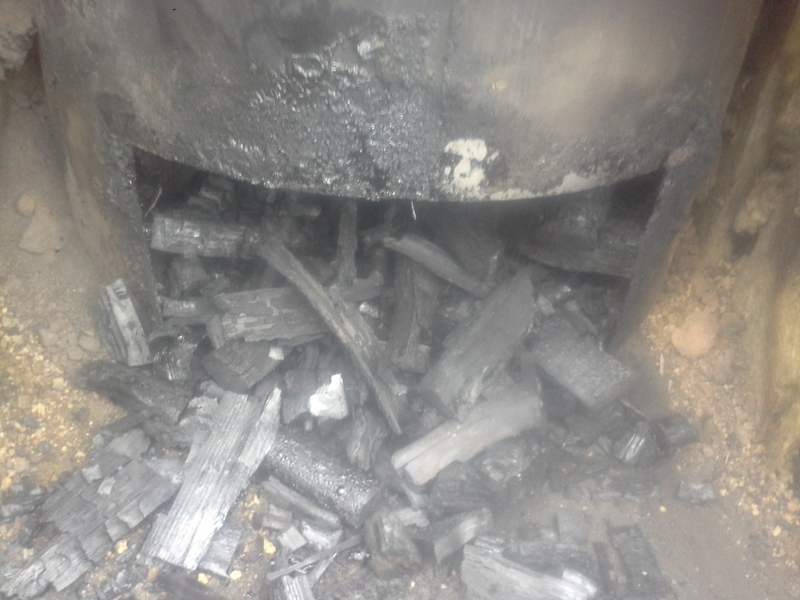 One burn of what ever woody material a month is actualy less work thain prepareing/drying chunks for a wood gasifier. 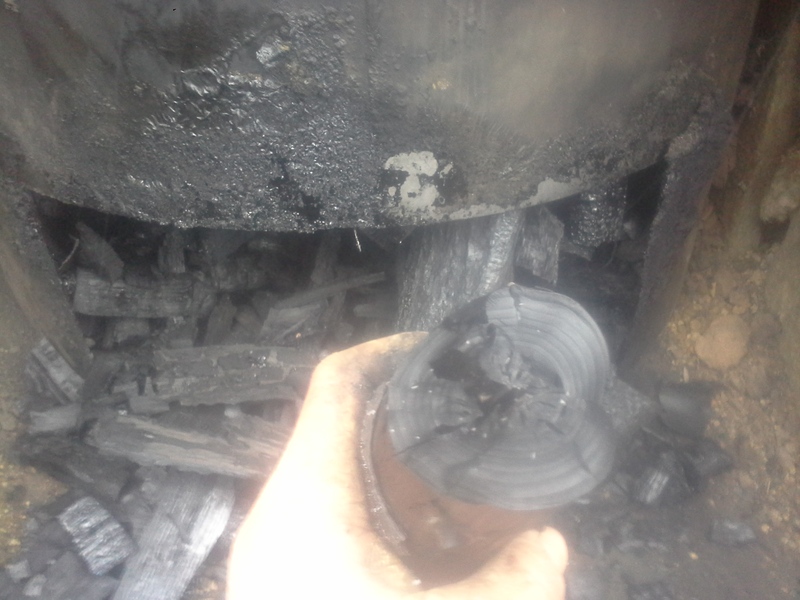 Per instance, its hard to see on the top picture, but the wood used in this burn is about 3-5" dia logs. 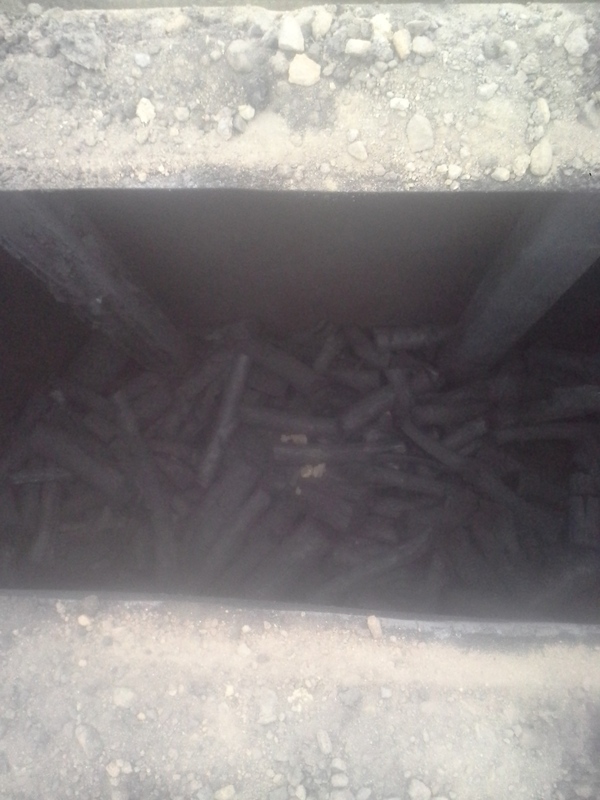 On the pic they look like twigs but those are some thick lumps of charcoal in the kiln! Those are fast to prepare, and, when enough time is on hand for steaming prior to charing, require litle air drying. Tom, thank you for reminding, l forgot to reveal the meaning of the name. No worryes Tom! 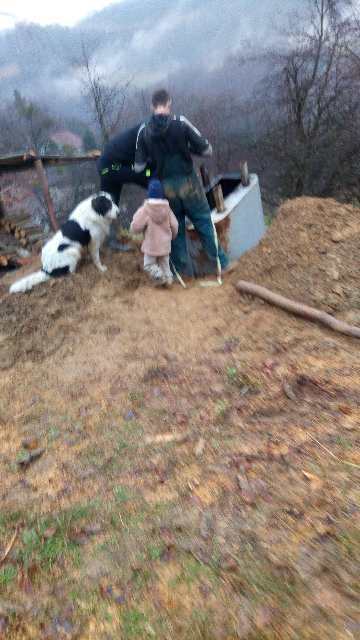 Better efficiancy of the gas is planed! 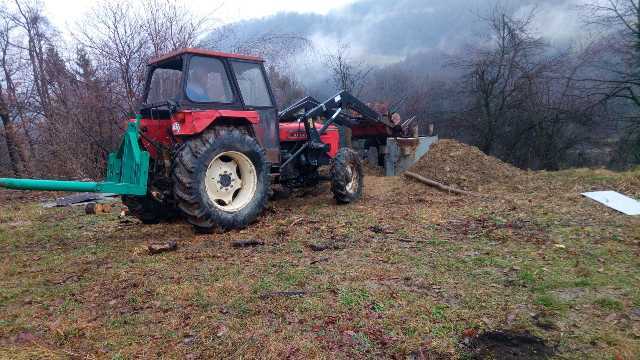 Cows are in warm stables, no need for heat there, but l am planing to condense the exes gases flareing in the video. This way l much neaded gain wood tar for wood inpregnation and maybee eaven paveing some gravel paths l have, and wood vinegar for the plants. The rest of burnable gas will be burned for self kilning. With what did you isolate the oven? 3 cm rorcwool. Nothing fancy. Yes its a gift and a curse. This warm damp weather makes my winter chores dificult. Too muddy to log with the tractor, to damp air to dry the meat products, so the pigs are still waiting in the stables. Just wondering. When do you freaking sleep?? 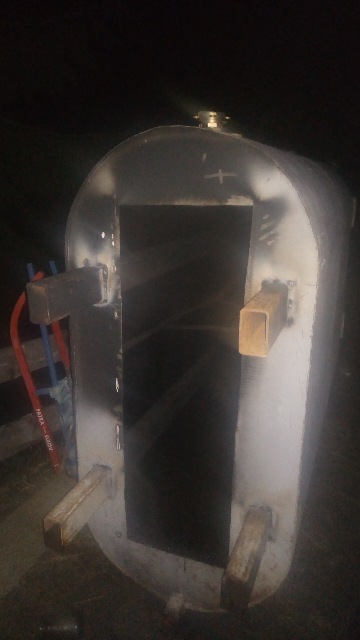 What is your next project to make the rest of us look bad? You develop concretely tools of resilience for all of us, you are very inspiring (a car that rolls with the wood, a station of charcoal, a greenhouse of food autonomy, food self - sufficiency …). I really regret that we did not meet last winter. My children who have your age would certainly have earned to meet you . If you decide one day to cross the Atlantic I can without problem welcome you. Was that a video of the SpaceK rocket blasting off? Ha, actualy l sleep a lot. Averidge 9 hours a day. Thierry, l regret we were unable to meet too. I plan to make it to Argos sometime in the future, but if you do decide to visit Europe again, you are welcome to visit and stay as long as you wish. Jeff, pitty the camera cant show the intense heat under there. I had absolutley no idea such heat can be generated just from pirolisis gas! I was actualy afraid the Kursk wuld collaps becouse the supporting legs were glowing red hot. There were 3 partly chared logs at the gate, everything else was premium ringing charcoal. 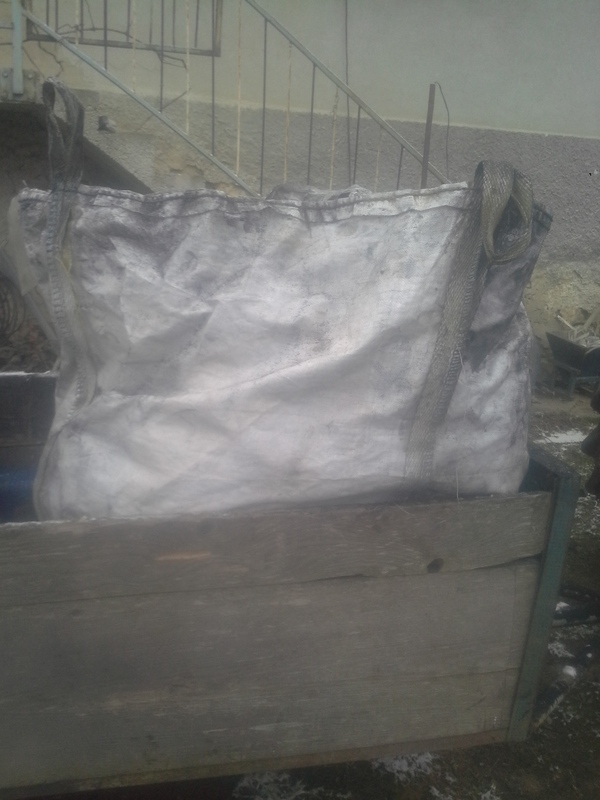 filled the big bag allmost full with grinded engine grade char. Allmost a month worth of fuel fotr the car. That clears it up a bit. Might want to turn that front steam vent up and away from you! Very impressed with the result, Charcoal looks great. Did the retort survive the heat? I had absolutley no idea such heat can be generated just from pirolisis gas! I wonder if this could be used for a cutting torch fuel… I bet the tar would plug up the torch and O2 would still be needed. Could fill up a gas bag, but, in time the bag might stick together. 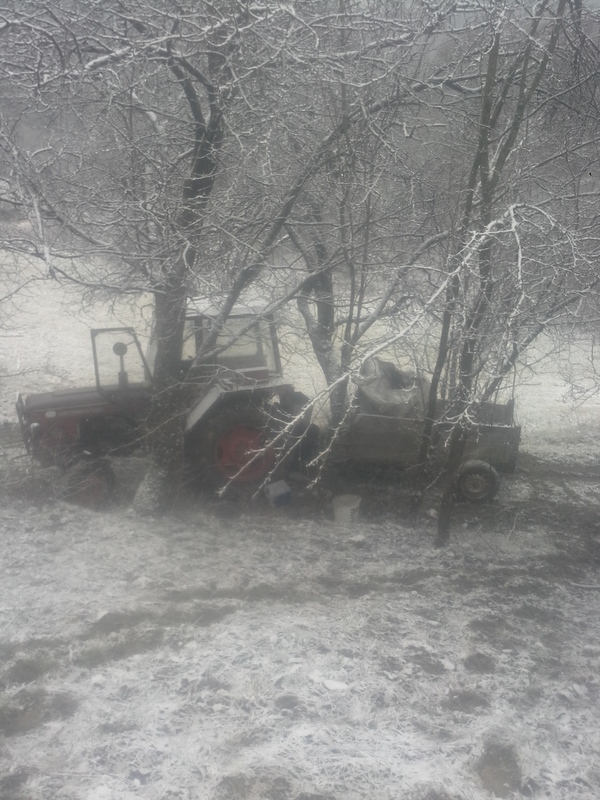 I like the cab on your tractor. I had absolutley no idea such heat can be generated just from pirolisis gas! I was actualy afraid the Kursk wuld collaps becouse the supporting legs were glowing red hot. It actually makes perfect sense, you have perfectly contained the heat from a large quantity of wood, then release the energy in a very short timespan. 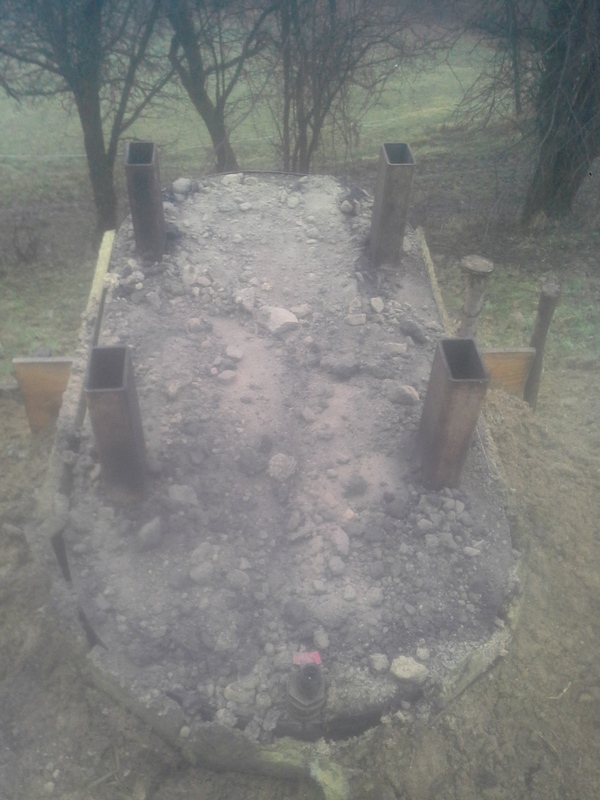 The energy is at least twice, maybe 3 times enough to charcoal the wood. Some systems will use the excess heat to dry and heat other batches. I am concerned about the lifespan of the retort if it is subject to runaway heating, but I am sure you have this in mind, and are getting practical results. Here’s a link documenting the runaway heating.